One day off of a tense Republican presidential debate in Las Vegas, a relaxed Donald Trump appeared on "Jimmy Kimmel Live!" in Hollywood, where he admitted to being a "little bit divisive" in the race. Trump, who had previously canceled an appearance on the show, talked about his rivals, foreign policy and his tough stance on illegal immigration. Kimmel pointed out that his on-camera sidekick, Guillermo, came to the U.S. illegally and has since gone through the naturalization process. Trump called him a "major star" but didn't waver on his policy convictions, even after Kimmel asked why Trump would not want people who want to be in the U.S. so badly that they're willing to risk everything. Trump again defended his call for banning admission to the U.S. of all non-American Muslims in the wake of a terror attacks in Paris and San Bernardino. He told Kimmel the plan prompted calls of support from Muslim friends. "Those may have been crank calls," Kimmel joked. The Republican front-runner continued his attacks on Jeb Bush, saying he isn't sure how happy Jeb is running for president. "Nice person," Trump said. "I don't know if he's enjoying it or not." He also questioned Jeb's notoriously emphatic claim that he would kill a baby Hitler, were he given the opportunity to go back in time. Trump told Kimmel he didn't think Bush could do it, because "he's too nice." Trump himself was a "no comment" on if he'd kill the hypothetical Nazi dictator infant. In a moment of self-reflection, Trump copped, unprompted, to being "a little bit divisive in the sense that I've been hitting people pretty hard," adding that he would "like to see the Republican Party come together." 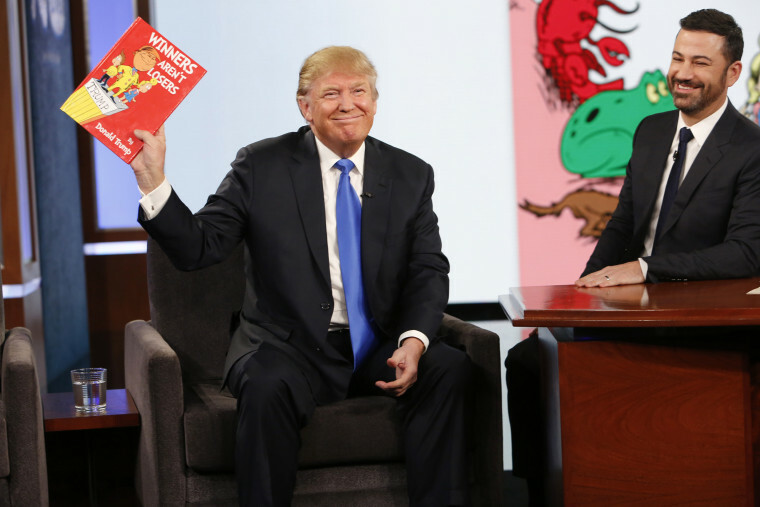 To close out the interview, Kimmel offered Trump a Dr. Seuss-like children's book he said he'd ghost-written for the candidate titled, "Winners Aren't Losers." "Here are some frogs I do not like at all. We must kick these frogs out and then build a wall," Kimmel read to a smiling Trump.